1. If you are facing this error, Try first to Full Process all your Dimensions and then reprocess your cube. If you face this issue select distinct key values from Dim table and Select distinct Key values from fact table , compare and check which key value that is present in Fact table and not present in Dim table . Investigate and plan your next course of action. If above point is true in your scenarios, you can insert missing Key value in Dim table that is present in fact table but not present in Dim table. You can restrict Fact table records for the key value that is not present in the dim table. 3. When there is a null value present in your fact table key column value. Some times while populating the fact table from different sources, we use many joins (left, right etc). Due to lack of data in any source tables, Key value can be null in fact table. Then you can face this issue. While designing the dim table you should insert one record with -1 for key value. This practice you have to follow for other key column values also. Doing so, when due to any reason if key value column have null from source tables then it will convert to -1 key column value in fact table .Now you have -1 as key value in both Fact table and Dim table. In this case there will be no chance of key mismatches and all the record will be aggregated under unknown or -1 and your cube will not fail during processing. 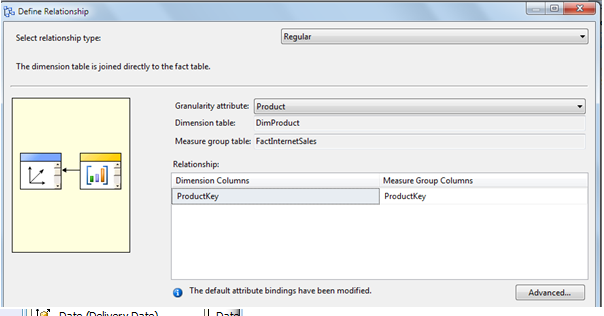 Now see you have populated -1 for the null key value column of fact table. It will match with -1 key value of Dim table. 4. Sometimes keys are present in the fact and Dim table but still you get this error. · In this case it might be the reason that you have used Named Query or View to build your dimension in cube where you have made some restriction/Filter etc.